This review is based upon the Cool White version of the Hound Dog. All versions of the Hound Dog head measure 2.75″ long and 1.8″ in diameter. 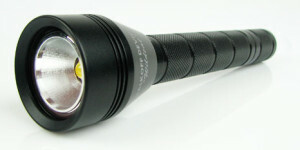 When mated to the MD3 body, the complete flashlight measures approximately 7.5″ or about 8.75″ long with the longer MD4 body. 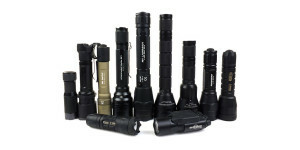 The 1″ diameter bodies are compatible with many accessories and mounts designed for tactical lights. The Hound Dog is solidly constructed of 6061 T6 Structural Aircraft Grade Aluminum finished with black Type III anodizing with the Malkoff Devices brand name and “Hound Dog” designation prominently displayed on the head. Each head is individually serialized for identification. 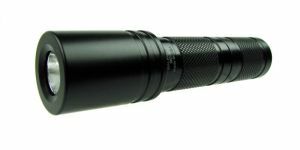 The Cree XM-L2 emitter and custom reflector are protected by a shatter resistant coated acrylic lens. All electronics are fully potted for reliability. The Hound Dog also includes the Malkoff brass High/Low Bezel Switch allowing two modes of operation. With an operating range of 5.5 to 12 volts, the Hound Dog can be used with several different battery configurations, depending upon which body is chosen. The MD3 body allows the use of 3 lithium primary 123A cells or 2 lithium-ion 18500 rechargeable batteries. The longer MD4 body permits the use of four 123A cells or 2 lithium-ion 18650 batteries. The shorter MD2 body can also be used with lithium primary or lithium-ion rechargeable batteries for a more compact package with very short runtimes. The inclusion of the High/Low Bezel Switch allows users to select between full output with the head fully tightened or low output with the head loosened a fraction of a turn. The brass High/Low Bezel Switch is completely housed inside the Wildcat head and utilizes a resistor to produce the lower output level, varying between 70 and 110 lumens depending upon the types of batteries used. With the big XM-L2 emitter and a deep textured reflector, the Hound Dog produces a broad beam with extremely good reach. The clearly defined center hot spot is nearly pure white while the spill beam has more of a cool tint. The corona around the center hot spot is somewhat greenish which is common for lights using the XM-L2 emitter. The textured reflector does a good job of smoothing the output of the XM-L2 resulting in an artifact free beam capable of reaching well over 200 yards. The following slides show the Malkoff Hound Dog compared to a variety of other lights to give some perspective with regard to output and beam profile. The images can be compared across their full width using the slider and additional comparisons can be viewed by using the navigation buttons in the bottom-right corner of each image. Runtime tests were conducted with a variety of battery types using both the MD3 and MD4 bodies. Output is most stable when the Hound Dog is used with lithium-ion rechargeable batteries but it also works well with lithium primary 123A cells. When powered by two lithium-ion rechargeable batteries, the Hound Dog maintains at least 90% of its initial output until the battery protection circuits trip due to low voltage. As there is no indication of the batteries becoming depleted, battery usage must be monitored to avoid being unexpectedly left in the dark. Lithium primary 123A batteries are not able to maintain full output for as long as the rechargeable batteries but they do provide a very long period of tapering output as the batteries are depleted, giving plenty of warning of the need to change batteries or switch to a backup light. Although the Hound Dog will work with some battery configurations in the shorter MD2 body, these were not tested. The Malkoff Hound Dog is extremely well suited for quickly scanning large open areas due to its combination of reach and intense spill beam. Although its output and beam characteristics are similar to many of the other XM-L2 based lights on the market today, one of the things that sets the Hound Dog apart is the fact that it maintains its initial output without any sort of pre-programmed “step down” or reduction in output. The Hound Dog can be counted on to provide its rated level of output for as long as the batteries can sustain it. The Hound Dog head is noticeably larger than many similar lights which allows it to handle the large amount of heat that can be generated during extended operation. Although it does get quite warm, the Hound Dog does not get too hot to touch or hold. 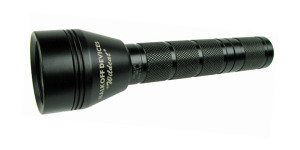 The High/Low Bezel Switch, exclusive to Malkoff flashlights, is one of the simplest yet most effective methods available for selecting different output levels. Although it doesn’t provide the options or wide variety of output modes of some other lights, its ease of use makes it one of my favorites. One-handed operation is a breeze and it’s nice being able to set the output level (high or low) before turning the light on. As with other Malkoff products, the Hound Dog’s modular design is a key advantage as it allows the head to be used with both the MD3 and MD4 bodies, increasing options for overall size and battery selection. Subjectively speaking there aren’t many lights that feel as solid or durable in the hand as a Malkoff and the Hound Dog is no exception. Fit, finish and operation are all top notch and there is no doubt the Hound Dog is a durable tool that will provide years of service. 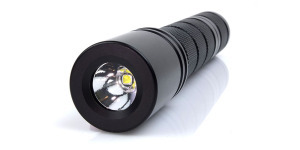 Its durability and flexibility with regard to configuration and battery types make it a must-have flashlight for me. Additional information about the Malkoff Hound Dog can be found on the Malkoff Devices website. The 123A primary batteries used in this review were provided by the nice folks at Battery Station. Be sure to share your thoughts, questions, or Malkoff experiences in the comments section below. Any chance you have a rough estimate on the run time and output for the Hound Dog V3 (XM-L2) when attached to the MD2 two-cell body using Battery Station primaries? Hi Richard, that’s a good question. I could have sworn I’ve tested that before but I’ve looked through all my files and can’t find anything. My best guess is that it would perform about the same as the M91B. If you check out that review you can see where I tested it with 2 Battery Station primaries. It gave about 10 minutes of 80% output and then started a long decline over the next hour or so as the batteries were depleted. Thank you Jim. I appreciate you taking the time to respond. 10 minutes at 80% is not too bad considering the compact size and the amount of output even at 80%.